Whether you are thinking of getting a plug-in vehicle or you have already made the leap into electrified transportation, one of the logical first questions is “how do I charge my car?” Assuming you live in a place where you can park in reach of electrical infrastructure, this essay will be relevant for you. Even if you have already decided that a regular 120V outlet is good enough for your purposes, please read on and consider what an upgrade might provide you and at what cost. Free - just use your 120V adapter that came with the car. Now let’s look at the basics of how it all works and then steer towards which charging solution is best for you including how to future-proof your installation. I will discuss some technical basics as they relate to this discussion. Feel free to skip over those if you just want to get to the practical stuff, but you might want to come back to the technical aspects as a reference later. If you had a rechargeable radio-controlled toy car as a child, the basics of EVs are very similar. It’s precisely that simplicity that gives them many advantages over the complexity of internal combustion engine (ICE) cars. To power the car, you need a battery that holds energy, an electric motor or motors that drive the wheels at variable speeds and auxiliary equipment for steering, comfort, etc. 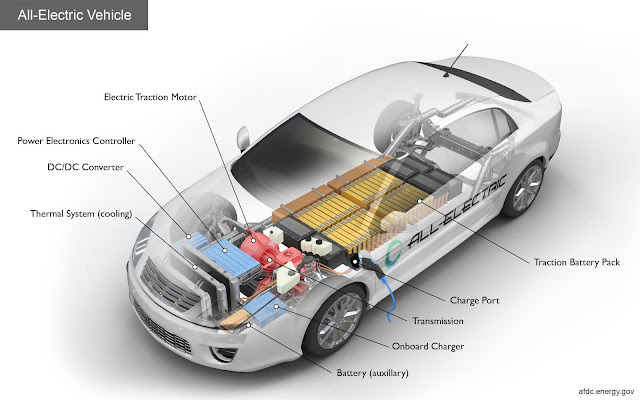 In contrast to an ICE car or even a hybrid, a pure Battery Electric Vehicle (BEV) uses only electricity and no liquid fuels. To get “fuel” or energy into the battery, we need a way to charge the batteries. Since we are concerned about charging in this discussion, note that the “charger” is on board of the vehicle. This will become important when we discuss charging power and speed. A power utility circuit from your home’s electrical box to the location of the car, presumably a garage or driveway. A variety of voltages and amp circuits will work, but each will provide a different speed of charging. 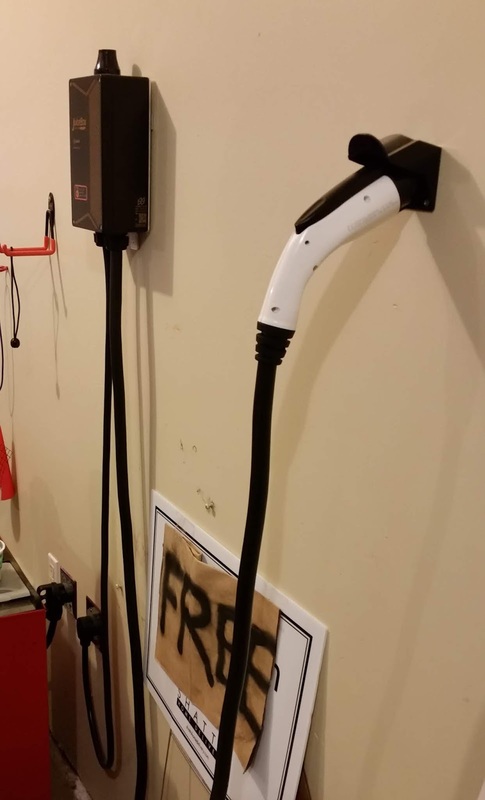 A way to convert the wall power to power your car’s plug interface can use. While many people call this a “charger”, the real term is Electric Vehicle Supply Equipment or EVSE. This includes a cord from your power circuit, a control device, a cord from the control device to your vehicle, and a plug that fits your car. The charging receptacle in your car. You already have this, it’s just a matter of knowing what you have and what it’s compatible with. The car charger. As mentioned above, this is already in your car. This is essentially like the little cube on your cell phone charger that convert household AC power to DC power that your battery can use. You don’t really notice this, but it’s good to know what the capacity is. More on that later. The difference between power and energy needs to be clarified within the context of electric vehicles. Power is the rate of energy transfer, both as a flow from the utility grid to the battery and from battery to the electric motor. The standard SI unit of power is the Watt. When powering an LED light bulb, the amount of power that flows from your wall into the bulb is around 5 Watts. EVs use a significant amount of power, so the quantities escalate to thousands of Watts or Kilowatts (KW). Energy is the ability to create a change, for example, creating motion. Tasks (like moving a car) require an amount of energy to complete. A battery will hold a particular amount of energy; so will a given amount of fuel, like food. Energy, particularly electrical energy, is typically measured in kilowatt-hours (kWh). If you look at your power bill, the total amount of energy you use and are billed for is in kWh. The capacity of EV batteries is also measured in kWh. Most North American households are wired for 120V 15A service with outlets dictated by NEMA standards. While a standard NEMA 5-15 receptacle is sufficient to bring power to your car’s battery, this is called trickle charging and will only add about 3-5 miles of range per hour of charging. Therefore 12 hours of charging will add around 36-60 miles of range. While this is fine to get started, most plug-in vehicle owners end up installing 240 Volt circuit in their garage which will increase the available power to add 10-30 miles of range per hour of charging. If you think of electricity like water flow, the potential measured in Volts (V) is equivalent to the pressure and the current measure in Amperes or Amps (A). Multiplying V * A approximately gives the power rating in Watts. Just like you can't get a lot of water flow with a narrow diameter low-pressure rated hose, you need a higher voltage and higher current wire to give you the additional power you need to charge faster. A typical 120 V 15 A circuit will only give you about 1,800 Watts (W) or 1.8 Kilowatts (KW), whereas a 240 V 50 A circuit can deliver 12,000 W or 12 KW. To avoid overheating and running too close to a circuit breaker's capacity, US electrical code states that a circuit should be continuously loaded to no more than 80% of its rated capacity, so a 15 A circuit should only be loaded to 12 A continuous and a 50 A circuit to 40 A continuous. The next step up available for home charging is a 240 V circuit, which typically comes in 16, 20, 32, and 40 A capacities. EVSEs (see below) can be either hardwired or plugged in with a variety of receptacles and plugs. They key is to have compatible plugs or adapters. What many people incorrectly call the car's "charger" is actually the EVSE. This equipment is often a cord with a plug that interfaces with the utility circuit, a box with electronics, and another cord with a plug that fits your car's charging receptacle. Most plug-in vehicles come with an EVSE that plugs into a standard 120 V outlet and allows you to charge your vehicle as soon as you drive it home. For example, the 2011-2017 Nissan LEAF comes with an EVSE that provides about 12 Amps of power at 120 Volts. More on detail on charging levels can be found on the US Alternative Fuels Development Center page regarding electrical infrastructure. Your car will have one or more charge ports built in that allows the EVSE to be connected. For the 2011-2017 Nissan LEAFs, there are typically two separate ports: the J1772 port (on the right) and the CHAdeMO quick charging port (on the left). The J1772 port or just "J-port" is standard on nearly all plug-in cars in North America. A notable exception is Tesla, which uses its own charging port type. However, since most public charging stations and most non-Tesla EVSEs use the J-plug, Tesla provides its owners an adapter allow the use of those stations. Since quick charging stations would be prohibitively expensive to install in a household environment, the J1772 is the port of interest for home charging. 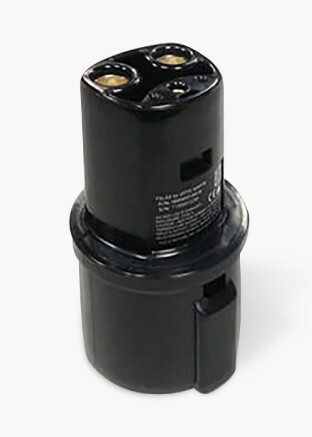 All commercially-sold EVSEs (other than Tesla branded EVSEs) will have a J1772 plug. Home power is delivered as alternating current (AC) and the battery of the car can only us direct current (DC), therefore plug-in vehicles have a built-in charger. A typical cell phone will use a wall charger that plugs into your home's AC power, a USB port that delivers DC power and a cable that connects the USB port to your phone. The charger has a power throughput rating in kilowatts (KW). 2012 and old Nissan LEAFs as well as some later lower-end "S" trim levels had a 3.6 KW onboard charger. The later models were fitted with a 6.6 KW charger. This rating limits the amount of power that can pass through and thus end up in your battery. That power rating is one of the pieces in the charging chain that limits charging speed. Because the charger is built into the car, it typically cannot be changed easily. Before deciding on an EVSE, you should find out your car's charger rating in kilowatts. There's one more piece that needs to be considered: the car's battery capacity. Your car's battery capacity is rated in the energy unit of kilowatt-hours (kWh). That is, the amount of energy it can hold and deliver over a period of time. This is also the unit that translates into miles of range. A typical EV will travel 3-4 miles per kWh depending on car size and driving conditions. The advertised range of a 2016 Nissan LEAF with 30 kWh battery is 107 miles (~3.6 miles/kWh). The advertised range of a 2015 Tesla P85D with an 85 kWh battery is 252 miles (~3.0 miles/kWh). So why go through all the detail of the car's charging system? Surely users of ICE vehicles don't need to understand how a gas pump delivers fuel to the gas tank. It's all about charging speed and range! A charging system capable of 3.6 KW can fill a 30 kWh battery in just over 8 hours (ignoring minor efficiency losses, 30 kWh / 3.6 KW = 8.33 hours) or add 13 miles of range per hour of charge. A 6.6 KW charging system can recharge that same battery in 4.5 hours or add 24 miles per hour of charge. If you're relying on trickle charging, your system may only allow 1.4 KW, in which case a 12-hour charge will net you 60 miles in a Nissan LEAF. Is 60 miles enough for your driving patterns? While the J-plug is rated high enough not to worry about charging speed, the other components of the system (power supply, EVSE and charger) form a chain, the links of which can restrict charging speed, even when the other components are capable of higher speed charging. My first EV was a 2012 Nissan LEAF with a 3.6 KW onboard charger. When I brought it home, I only had a wall outlet from which to charge. I also only had the included 1.4 KW Nissan trickle charger at my disposal. 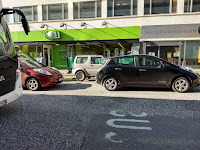 The rate limiting link in the chain was the Nissan EVSE which limited the charging power to 1.4 KW and thus around 5 miles of range per hour of charge. I had an electrician add a 240 V 30 A circuit to my garage ($300) and purchased a Clipper Creek LCS 25-P with a NEMA 14-30 plug ($485). With this combination, my charging speed dramatically increased. Now the LEAF's onboard charger became the limiting step with 3.6 KW or about 13 miles of range per hour of charge. This was more than good enough for an overnight full charge. The 24 kWh battery capacity charged at 3.6 KW gave a 0-100% charge time of just under 7 hours. I upgraded to a 2016 LEAF with 30 kWh battery with a 6.6 KW onboard charger. Now my Clipper Creek EVSE was fully utilized, but also became the rate limiting link in the chain. Still, my 0-100% charge time dropped to just over 6 hours. At this point, if I wanted to fully exploit my new LEAF's charger speed, I would have to upgrade my EVSE. My 30 A circuit still had additional capacity to match the LEAF's onboard charger, but I would be limited to 24 A or around 5.7 KW based on the 80% continuous load rule. Around the same time, I added a Tesla Model S to my garage. In order to charge a Tesla with 9.6 KW onboard charger at its full capacity, I would have to upgrade both my house car charging circuit as well as the EVSE. Since the Tesla comes with its own portable 40A EVSE, only the house wiring would need to be upgraded. Otherwise, the 30 A circuit with its 24 A continuous load would become the rate limiting step. As a result, I later added a 50 A circuit and a 40 A EVSE to enable maximum rate charging for both vehicles. Now that we've covered the building blocks of the charging system, charging speed becomes a matter of desired charging speed versus cost. The car's onboard charger will always be limiting until you buy a new car since there is no cost-effective way to upgrade the charger. The question you need to ask yourself is how fast do I want to charge and what am I willing to spend? That brings me back to my recommendations at the top of the post. 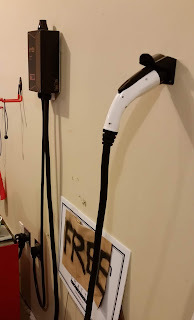 You can always resort to trickle charging with the included EVSE. At the time of this writing, I am currently in a rental apartment while I'm building a new house. My only option at home is a 120V outlet in my landlord's garage. I also don't need to drive more than 50 miles per day. I do have a 6.6 kW public charger down the road if need to charge a bit faster. 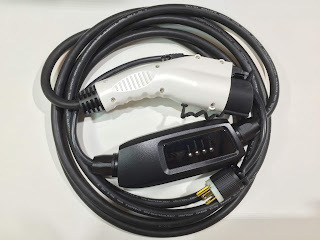 If you only ever plan on charging Tesla vehicles and will only have visitors who have Teslas, you can charge your car with the included Corded Mobile Connector. 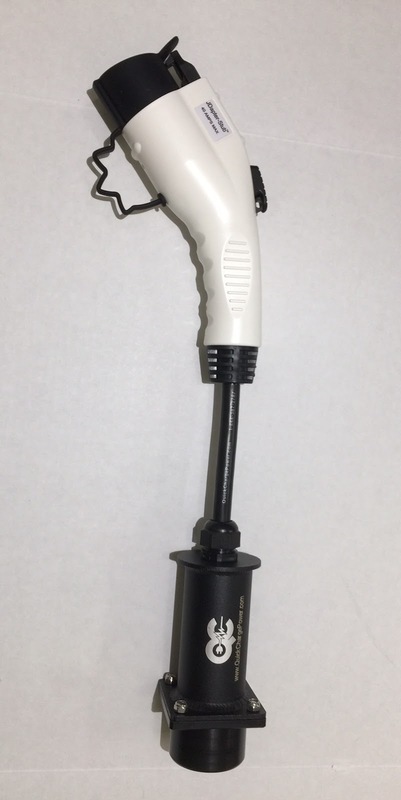 You will need a NEMA 14-50 outlet in your garage to get the maximum speed, although the Mobile Connector also includes a trickle charging NEMA 5-15 adapter in order to use a standard household outlet. Given the size of Tesla batteries, it's unlikely that trickle charging will be sufficient for most Tesla drivers. If you do end up needing to charge a non-Tesla vehicle, Quick Charge Power sells a reverse adapter in the form of a JDapter Stub. There are several low-cost EVSEs on the market including the Amazing E Portable Charger for $219. The Amazing E requires a NEMA 14-30 electric dryer style outlet. An electrician can give you a quote for the wiring required to add such a circuit to your house. In my last house, it cost only about $300 because of the short run between my electrical panel and the garage. Quick Charge Power also makes a portable Go Cable ($199) with similar capabilities. Just be aware of what connectors are included and what you would need to make it work with your house's outlets. 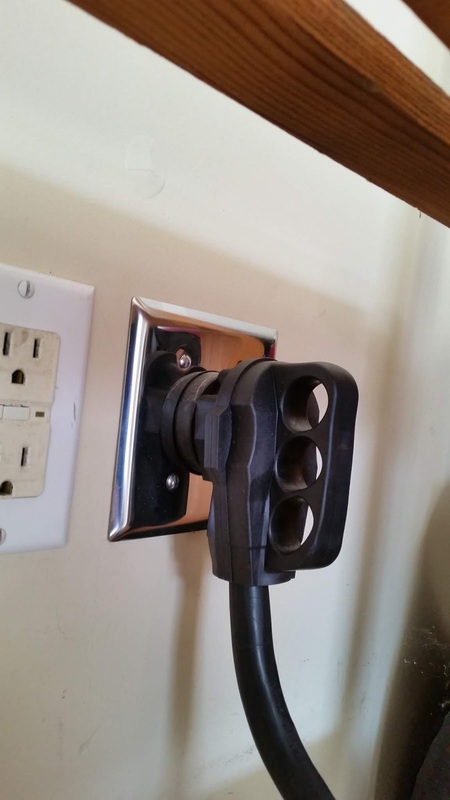 My recommendation would be a NEMA 14-50 receptacle and outlet since it's a bit more universal than the NEMA 14-30. Also, the NEMA 14-50 is the same receptacle used by RV parks. Therefore, assuming you can get permission and pay for the service, you can charge your car in any RV park. Therefore, I find the Go Cable slightly more desirable than the Amazing E solution. Since most recent EVs have at least a 6.6 KW onboard charger, I would look for an EVSE that has at least a 30 A rating that should match or exceed the onboard charger capacity. 6.6 KW will give you 18-25 miles of range per hour of charge so well over 250 miles during a 12-hour overnight charging session. This price range has a lot of competition and while I like the Quick Charge Power Jesla Jr, there are many sound competitors in this segment. Clipper Creek has a very solid line-up of 240 V EVSEs with 32 A models nudging just over the $500 price point. A recent Engadget article favored the Siemens Versicharge which has some basic timer features and still falls within the sub $500 price point. Charge timers are particularly useful if you want to charge your car on preferential nighttime power rates. Also, since lithium-ion batteries have their best longevity when not exposed to greater than 80% state of charge for extended periods of time, charge timers can be set to only go over the 80% range shortly before the car is driven thereby minimizing the time at a high state of charge. As the EVSE market matures, I suspect there will be more competent players in this segment. Please be careful of no-name EVSEs such as what you may find on eBay. While 120 V will give you an annoying and painful shock, 240 V has much more potential for serious injury and death. Find an EVSE that has proper safety certifications such as a UL listing stamp. If you are willing to spend more of your hard-earned money, high-end EVSEs can provide more power and additional features such as Internet connectivity, charge timers, and a smartphone app to control them. My favorite among these and what the above-mentioned Engadget article recommended is the eMotorWerks JuiceBox Pro 40. 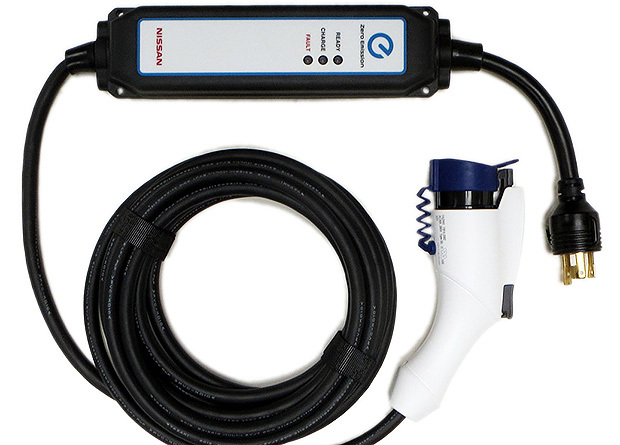 This EVSE is also what I personally have in my garage. 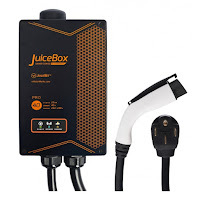 While previously well over $600, the JuiceBox Pro 40 has now dropped in price to $549 and eMotorWerks has been known to run specials during events like National Drive Electric Week. 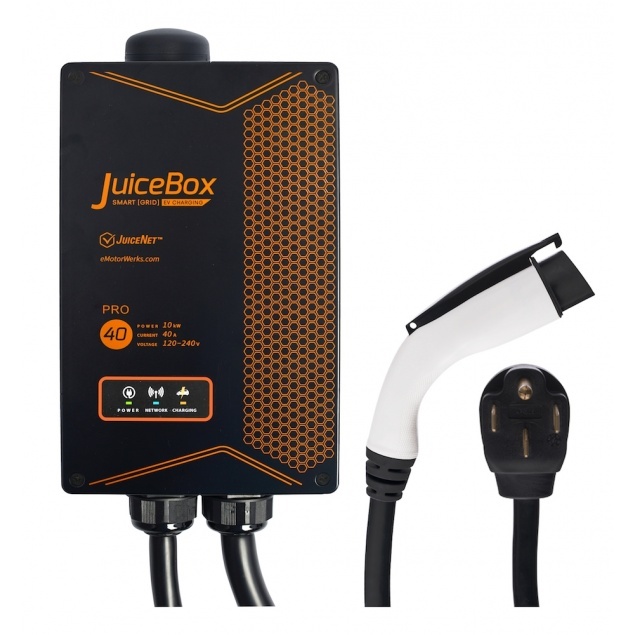 The JuiceBox Pro 40 features 40 A / 9.6 KW of power and plugs into a 50 NEMA 14-50 receptacle. This not only charges an EV with 6.6 KW onboard charger but also a Tesla at full onboard charger rates. Note that if your Tesla has dual onboard 40A chargers, the JuiceBox will still only charge at 40 A. In order to take advantage of the dual chargers, you would need to install the 80 A capable Tesla High-Power Wall Charger. The JuiceBox Pro 40 also connects to your home WiFi network to give you data monitoring and full control via the JuiceNet app. I find the control feature particularly useful for cars that do not have a setting to stop charging at the recommended 80% charge for daily driving use. The JuiceNet app lets you see data on ongoing and previous charging sessions, summarize your power use data by vehicle, set your maximum charge rate based on different vehicles, set charging timers for preferential nighttime power rates, get reminders to plug in and many other features. JuiceNet is also compatible with Google Home and Amazon Echo, so you can set a Google Home or Alexa skill to start and stop charging and monitor progress via these popular home digital assistants. 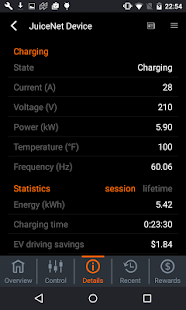 If you use ChargePoint public chargers and find the reporting features of power usage useful, ChargePoint also makes a home charger with networking and data reporting features. 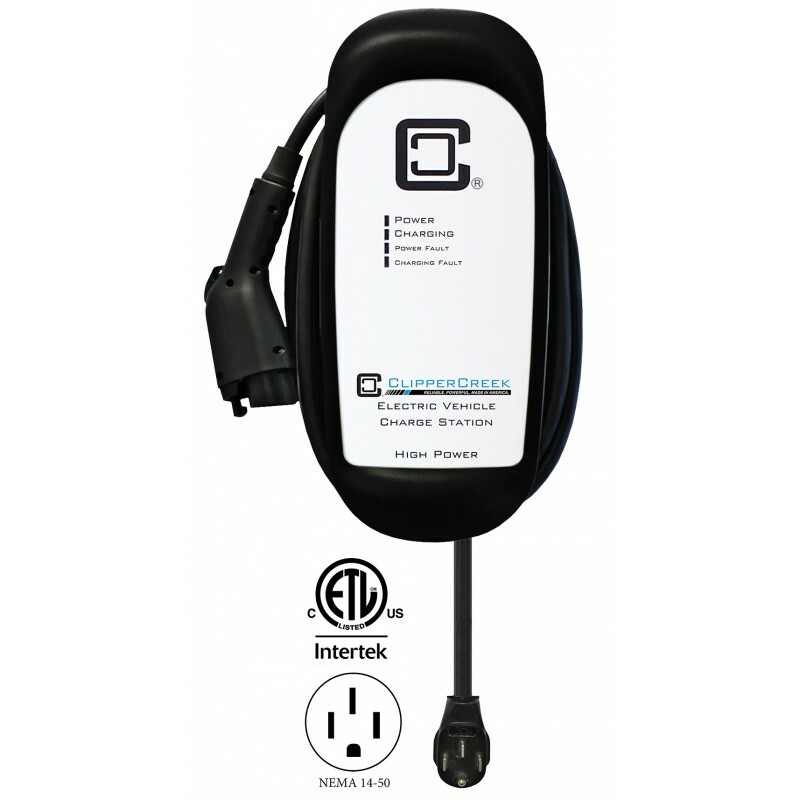 While the price point per EVSE power is a bit higher than competitive products, installing this charger would allow you to keep all of your statistics and reporting on one platform, both on the web and with a smartphone app. ChargePoint also runs specials during events like National Drive Electric Week. I briefly touched on some helpful features of your home charging system above. Getting data on your charging habits, usage data, and cost savings are a boon for those of us who enjoy this kind of geekiness. There are a few additional features that can protect your vehicle's battery and save you money on your power bill. Lithium-ion cells used in most EV batteries degrade over time. For optimum battery health, particularly on battery packs that are not thermally managed, it's best if batteries are only charged to about 80% of capacity. More precisely, it's best if the state of charge does not exceed 80% for long periods of time. More details on this phenomenon including a helpful graphic representation, particularly for the Nissan LEAF, can be found in David Laur's blog post "If You Have Battery Degradation, Read This!". Many EVs have maximum charge levels built into their charging systems for daily use, but some do not. If you do need to exceed 80% charge for a road trip, it's therefore best if the high state of charge is reached shortly before departure. A charge timer is the best way to address this issue. Some vehicles have charge timers, but some do not. An EVSE-based timer feature that can be used to compensate missing car-based timer features. Some electricity utilities give preferential nighttime power rates. In order to take advantage of these cheaper rates, you can program either your car or your EVSE to only charge during those times, thereby getting maximum benefit from such preferential rates. Check with our utility whether such rates are available, and then decided if an EVSE timer feature is helpful to you. Some EVSEs, such as the ChargePoint Home can link with power providers to manage those timer setting automatically. Once an EVSE is networked and allows you remote control, it's only a matter of software or smartphone app updates to add new features. The Amazon Echo and Google Home features for the JuiceBox and ChargePoint Home were added after their initial release. Adding a 240 V circuit will require installation by an electrician or other qualified person. The cost of this addition will vary based on whether your current electrical panel can handle the additional load and the length of the wiring. Obviously you should get multiple quotes to ensure fair pricing from your installer. The circuit is mainly comprised of the breaker, the wire, and the receptacle. The heavy gauge wire required for high current circuits can get expensive for long runs. Note that the labor to install the new circuit can be a significant part of the expense, so make sure you install a large enough capacity for future needs as well. More discussion on that below under "future proofing." You can simply unplug your EVSE when you move. No need to unwire it. There is no need to leave wiring dangling out of the wall when you move. The receptacle is also a selling point for prospective house buyers with plans to charge an EV. 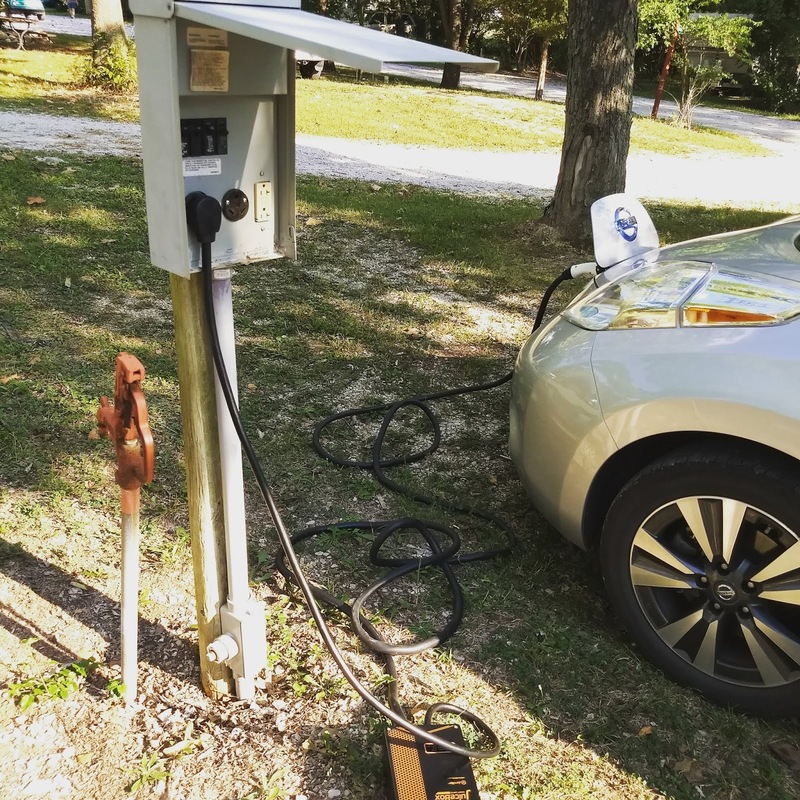 You can take your EVSE with you and use it at a friend's house or even an RV park. RV 50 A receptacles are NEMA 14-50 and you can just plug in and charge. A Tesla can plug directly into a NEMA 14-50 outlet with their mobile connector, either directly or with a specially-designed extension cord. What kind of charging infrastructure should you install in your house that will still be relevant in 10 years? While it's difficult to predict technological progress that far in advance, you can make some decisions about your installation that will push the need for upgrades down the road a bit. In my examples above, you may have noted that I first installed a 240 V 30 A circuit in my house and I purchased a 20A EVSE. This provided the necessary 3.6 KW for my Nissan LEAF. When I upgraded to a 2016 LEAF and added a Tesla, I later added a 240 V 50 A circuit. Since the breaker, wiring and receptacle had been chosen to match my needs at the time, none of those could be reused for the 50 A circuit. Therefore, a new circuit was added rather than upgrading what I already had installed. I also sold my old EVSE at a loss and upgraded. Experience is something you get after you need it, so I didn't have the foresight so spend a bit more money on a larger breaker, heavier gauge wire, and a 50 a receptacle. While early EVs only had a range under 100 miles and batteries in the 20-30 kWh range, the current generation of EVs are now being fitted with 60-100 kWh batteries. It's possible that future vehicles may have batteries near 200 kWh to provide ranges in excess of 500 miles, but at some point there is a practical limit to the capacity of future batteries. Bigger battery capacities also do not change the fact that Americans drive well below 100 miles per day and that's really all the capacity we typically need to replenish on a daily basis. All my calculations have been on a 0-100% state of charge, but typically EVs come home with charge left in the battery and we only charge to 80% to minimize battery degradation. Start with your included 120 V trickle charger and see if it meets your needs. You may also have public charging infrastructure that can augment your trickle charger when you occasionally need to charge faster. If trickle charging is definitely insufficient, a 240 V 50 A circuit with a NEMA 14-50 receptacle can provide 40 A or 10 KW of power (remember the 80% factor for continuous use) at a reasonable price today. 9.6 KW translates into 30 miles of range per hours of charge, even for the energy efficiency of a large vehicle like a Tesla. That translates into 360 miles of range added during 12-hour overnight charge. So a 240 V 50 A circuit and a 40 A EVSE should be sufficient for quite some time. Again, I recommend a NEMA 14-50 receptacle over a hardwired EVSE. Alternately, one of the intermediate recommendations at the top of the article may suit your charging needs. One way to future proof just a bit more is to install wire gauge that is suitable for a 100 A when installing the above 50 A circuit. Tesla's High-Power Wall Charger is already rated for 80 A and will require such a circuit. An electrician should tell you the answer the wire question, but this wire gauge calculator points to fairly stout wiring that may be fairly expensive depending on the length of the wiring run. Assuming your overall electrical service can handle the additional load, the future upgrade would only be a new breaker and the appropriate EVSE. Most EV buyers are familiar with tax incentives (Plug In America link) on EVs, particularly the $7,500 federal tax credit. Some states also give tax credits for EVSEs and charging infrastructure. Since this is an ever-changing field, please check with your tax adviser. As an overview, Clipper Creek has a page on EVSE Rebates and Tax Credits, by State. Note that some incentives cover not only the purchase price of the EVSE, but also installation costs. So be sure to keep all receipts for such purchases and installation. Only you can determine what your daily charging needs are and what they are likely to be in the future. Also, only you know what your budget is for such a home project. Once you determine that 120 V trickle charging is insufficient, a 240 V 50 A circuit with an EVSE that fits your budget is the next logical upgrade. Good article, Karl, you obviously worked hard on it. I have a few suggestions for improving it, in case you are interested. I hope you take them in the spirit they are given, not negatively. One of the biggest obstacles I encounter in trying to explain this stuff is the general confusion between power and energy, with respect to electricity. Your second paragraph in “Putting it All Together” exacerbates this confusion, by saying that a battery holds “power”. If I were trying to help people understand EV charging, I would insert a paragraph very early in the article clearly stating that power is the RATE of energy transfer. I would emphasize the difference between kilo-Watts and kW-hours, possibly referring to a person’s electric bill. I would not take for granted that people understand the kilo- prefix just means a thousand of something. And I would state that the Volt unit measures neither power nor energy. Since you already use “kW” in your quick recommendation paragraph, in this article I think the energy/power discussion should come in the introduction, even before “How an EV works”. Then some of your later text on power and kW can be abbreviated. Be rigidly consistent in using kWh for energy and kW for power. A battery stores energy, and the rate at which it is used for driving or refilled during charging is power. Nitpicks: You use the term “Level 2” without talking about any other levels. Similarly, you mention “quick charging stations” in the EVSE section without defining the term. I always thought the S in EVSE stood for “service” but I see both supply and service used on the web, so I guess they are interchangeable now. Hi Paul, I very much appreciate your constructive feedback! As an engineer, I have written my share of technical documentation, but I sometimes forget that some readers may not have the same background as I do. So shame on me for not getting the technical details right and for not making them clearer. As I continue my writing journey, again I say THANK YOU for taking the time to send me your comments.